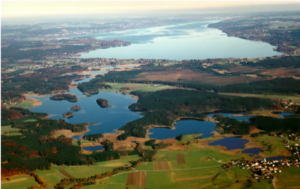 How will ecosystem services and biodiversity develop in Bavaria? The interdisciplinary collaborative project BLIZ takes a glance into the future and develops new scenarios for a sustainable management of ecosystems in Bavaria. BLIZ is a joint project of the Technical University of Munich (TUM), the Julius-Maximilians University of Würzburg (JMU), the University of Regensburg (UR) and the Friedrich-Alexander University of Erlangen-Nuremberg (FAU). BLIZ consists of 6 subprojects. We investigate the impacts of climate change on ecological systems (ecosystem services and biodiversity) and socio-economic systems (land use development) and their interactions. With the help of computer-based simulation models, we investigate which adaptation strategies lead to a stabilization of these systems and under which circumstances drastic ecological degradation or socio-economic changes (so-called tipping points) can occur. Which impacts do climate and land use change have on Bavarian ecosystems? What are sustainable social and economic (land use) strategies for Bavaria that could counteract the loss of ecosystem services and biodiversity? How can ecological and socio-economic tipping points be avoided? to communicate these strategies to stakeholders.